IOM is at the forefront of efforts to collect data about displaced people, and has partnered with the Centre for Humanitarian Data to ensure this data is accessible to those who need it. Since October 2017, I have been working with the Centre for Humanitarian Data in The Hague to improve collaboration between OCHA and the International Organization for Migration (IOM) on displacement data. Through this staff secondment, IOM hopes to make it easier for its field staff to share data through HDX and to increase the interoperability of this data by using the Humanitarian Exchange Language (HXL). IOM’s Displacement Tracking Matrix (DTM) is a system used to: 1) track and monitor displacement and population mobility; 2) provide critical information to decision-makers and responders during crises; and 3) contribute to better understandings of population flows. DTM is used across various stages of a humanitarian response – most commonly during the emergency phase — to inform assistance to displaced people. DTM includes four standard components each comprising various tools and methods that can be applied, adapted and combined as relevant for a particular context. The components are mobility tracking, flow monitoring, registration, and surveys. IOM has over 4,000 people collecting DTM data in more than 50 countries. Over the course of 2017, 31.5 million individuals (IDPs, returnees and migrants) were tracked by DTM. Sharing DTM data with a broader audience increases the reach and impact of this data. IOM field staff are uploading and updating DTM data on HDX as part of our new standard operating procedure. 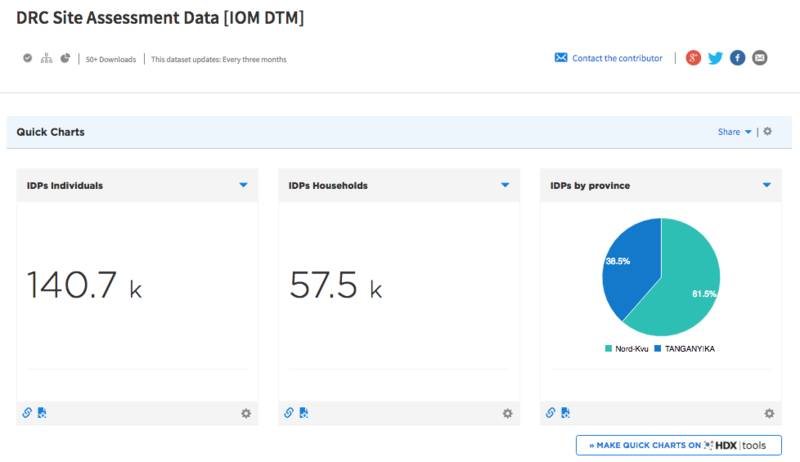 Currently, 68 DTM datasets are available through the IOM page on HDX. By the end of 2018, our goal is to have all public DTM datasets on HDX, with 60 percent HXL-tagged, either manually or through APIs. Interactive map on the IOM HDX page showing all locations where IOM is tracking migration flows (red), internal displacement (yellow) or both (blue). The dataset that feeds the map can be found here. Most of the DTM datasets are tracking population mobility. This includes different types of assessment data such as: baseline assessments, site assessments, location assessments, IDP data and returnee data. The majority of these datasets are disaggregated by age and gender. Sensitive data such as flow monitoring of Venezuelan migration is shared through HDX Connect. IOM makes only the metadata available and provides access to the underlying data upon request. Sensitive data can only be shared with operational actors. IOM teams are also adding HXL hashtags to DTM data to improve data processing. Adding the tags means we can take advantage of HDX Tools, including Quick Charts for visuals and Data Check for cleaning. Some of the common tags we are using include administrative division, geographical information, population, sectors, needs, and incidents/event. 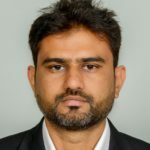 This effort is part of a wider collaboration with Flowminder and the Internal Displacement Monitoring Centre (IDMC) to contribute to a better understanding of human mobility in crisis and enhance links with citizen-driven assistance. The work is supported by ECHO and the Netherlands Ministry of Foreign Affairs. The Centre recently hosted an IDMC Displacement Data Roundtable on 6-7 June in The Hague. The objective was to develop a roadmap for future collaboration around the collection and analysis of data on internal displacement. IOM is committed to working with the Centre over the long term to simplify data sharing, extend the impact of DTM data and standardize data across IOM operations. We are working to develop a Representational State Transfer (REST) API for IOM’s central data warehouse which give partners easy access to up-to-date DTM data in a reusable format. To learn more about this work, please contact me through centrehumdata@un.org or on Twitter @KashifNadeem.